Practical Bible Teaching: WHAT IS THE CONTENT OF OUR SONG? WHAT IS THE CONTENT OF OUR SONG? While tempo, rhythm, and pitch are necessary considerations for the ones leading the praise and worship portion of the service, it is also necessary to consider the lyrics of the chosen songs. There are distinctions in the types of songs we sing, and if those distinctions are not understood, the possibility—even the probability—of losing the congregation are greatly increased. 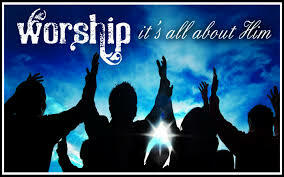 The worship team’s goal should be to usher the people into the presence of the Lord. I will say yet again that the people are coming into the sanctuary from their own personal battles. Their intention is to worship the Lord. Their desire is to hear from God. For most, that is easier said than done. It is your job as part of the worship team to provide the necessary means to make that somewhat easier for the weary and the wounded. As mentioned before, the first thing to do is help lift their spirits through music. Therefore, the music must be uplifting. The words also play an important part. Our songs fall into many different categories. These are only a few, and hardly any song can be neatly placed into only ONE category. Not every spiritual song we have in our repertoire is a worship song, just as not every song is a song of praise. Slowing a song down does not make it worshipful any more than speeding a song up makes it praise. It is the words and the music together that must be considered. So, if we are “entering His gates with thanksgiving,” (Ps. 100:4) would it not be appropriate to find a song that expresses thanks unto the Lord? If we are going “into His courts with praise,” (Ps. 100:4) would it not be wise to sing a song with words that praise the Lord? Many of the songs today have nice words, but they could just as easily be sung by a lovesick teenager to their dreamy one. I stand amazed that we can go through an entire song set at church and never once hear the name of Jesus mentioned in a lyric. How can this possibly help bring people’s minds off their troubles and onto the Lord? While Zacharias is arguing for a return to good teaching sermons as a part of our gatherings, I want to use his idea as it applies to the songs themselves. When I came into the things of God, the only songbook we had was our Bible. Our Bible was our songbook; our songbook was the Bible. Minstrels were being raised up all around us who could write songs from what they were reading in Scripture. I can’t read one of those verses today without hearing the tune in my head. I look for scriptural content in our songs of today. Sometimes I have to look very intently. Even then I still come up short, having found nothing of any value from the words. I’m not saying that the songs must come from the bible. I’m saying that I should be able to find bible truth within the song, and that truth should have some depth to it. Yes, it is true that God is good. But to sing it over and over again for seven minutes, and then do the same next week is not teaching me about God. It is only emphasizing one singular aspect of the Lord of glory. I am left with whatever my particular concept of “good” is, and I apply that to God. Is it possible that my particular definition of “good” may not be the whole truth? Could it lead me into deception? Excellent word. And while the article is mainly on the words, at least you did mention the melody and for that I thank you. Please notice scripture does say "melody." Not "beat." When I have led worship, I ALWAYS start out with the tune. And that is probably my No. 1 issue with the music of today. If there is no tune or it is mediocre at best, I'm probably not going to use it. So, why do I do this? Aren't the words important? Yes they are. Very much so and I don't care how great the melody, if the words are not good ones, it doesn't get sung. But.......and here is the clincher: I want the worship time to go much longer and way beyond the few minutes allotted to it. In other words, I want the people to leave the service and go on about their day with the SONGS RESONATING IN THEIR SPIRITS. And it takes good melodies to do that. The melody aspect of today's music is every bit as non-existent as good lyrics are. They are typically limited to 3 or 4 notes, if that many, that are more spoken than sung. But that's another writing all together. By being centered around only 2 or 3 notes that are belted out using the vocal chords designed for speaking, not singing, the pop industry has managed to convince most of us today that we cannot sing. However, God wants us to sing and apparently wanted it so much that He gave us a 2nd set of vocal chord specifically designed for doing so. However, because they often don't sound great to us (when compared with pop singers), we refuse to use them. And like most things of value in life, they are only developed and fine tuned with use. But we allow pride and self-absorption to keep us from doing so. So we remain pretty much "silent" "worshippers." But....I will stop here. However, as I said great word. And yes, the Bible was our songbook and our songbook was by and large our Bible. I am so grateful for that. It DID implant scripture in my heart. Scripture that re-shaped my life. Thank you, Lord Jesus, for that wonderful wonderful gift. And thank you Dale, for these thoughts you share with us. Thank you, Charlotte. I agree with you. Not being a trained musician, I was reluctant to write what I shared privately with Gracie—"I'm listening to so-called worship songs that have less than 20 words, 3 notes and 2 chords. That does not stretch the musical ability of most." I have listened to numerous songs like that, and they will consume almost 10 minutes of repeating nothing of substance in a melody not much beyond a monotone, with an indistinguishable, syncopated beat. I stand completely lost in that kind of an environment.